For some inexplicable reason, Capcom has re-released the highly obscure mobile phone game, "Kobun Flies?" today in Japan. The new version of the game is now available to SofBank and Au mobile service customers for 315 Yen, or roughly $3.74 US. Kobun Flies? is a simple little game, originally released way back in 2001. 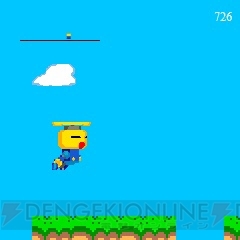 You play as a Kobun with a propeller fashioned to its head and it's your job to guide the fellow through a series of autoscrolling platform-based stages. Time you jumps right and you'll successfully make it to the end unscathed! As a neat little bonus, a number of characters from the DASH series are hidden throughout stages whose appearances are triggered by completing certain conditions. These same characters even appear sporting Christmas attire in the follow up holiday themed game, Kobun Flies? Xmas, in 2002. If you happen to have the means of obtaining the game, you can do so in the above link. Love to score some footage of this one so if you have it, please share some video! 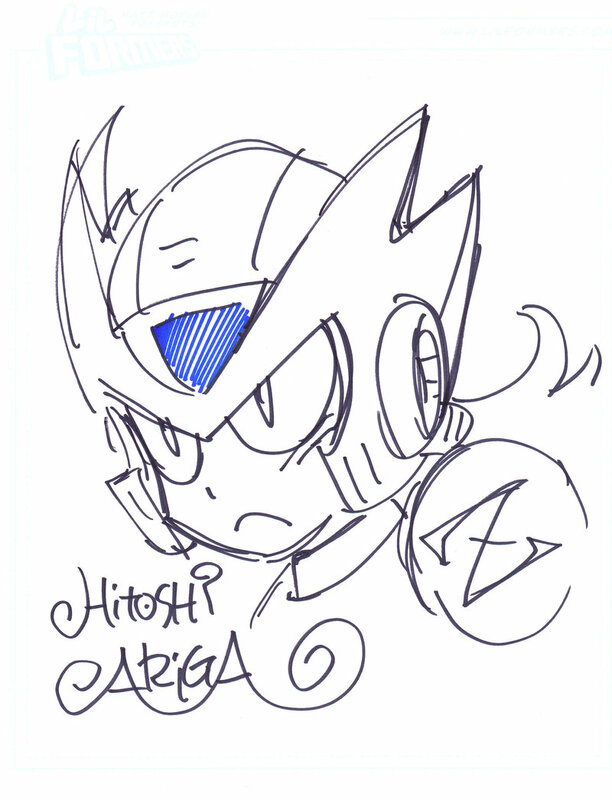 Mega Man Megamix author Hitoshi Ariga stopped by FanExpo this past weekend, and while I wasn't there to indulge in the festivities, readers Saber Chan and Joshua were, scoring some nifty sketches from the man himself. The illustrations consist of characters from Mega Man himself to a helmetless Bass! Scope them out below. His favorite Mega Man games are Mega Man 2, X1, Battle Network 3, and Mega Man Legends. 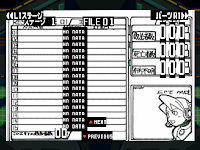 His favorite classic series character is Cut Man; his favorite Battle Network character is Heat Man.EXE. Least favorite, most hated character is Auto. If he ever got the chance, Ariga would love to produce a Mega Man Legends comic. Ariga revealed he's a big fan of the Pokemon series and was even trading with fans on Saturday and Sunday, giving away Mudkip and a Misdreavus. Seems like a pretty cool guy, Ariga. Did you attend the event? Let us know how it went in the comments! Once more, thanks for the pics and info, Saber Chan and Joshua. FanExpo isn't just a convention focused on all things gaming, comics and anime, but also a venue for independent artists to exhibit and sell their work. Spotted at the event this past weekend, here's a nifty piece of art that some of you will surely dig; an eye-popping, 3D recreation of the famous Mecha Dragon boss battle from Mega Man 2. The piece was for sale but there's been no word if it sold or not. The artist's identity is shrouded in mystery, too. Nevertheless, it's a really awesome piece of work. Full sized pick available here. Bit of a slow news weekend, but here's something PlayStation savvy fans might want to keep an eye out for. According to Amazon's online PlayStation Network shop, a series of Mega Man-themed PlayStation ID avatars are set to release on Augusts 31 for $0.49 a pop. Three avatars are in the works: Roll, Doctor Light and Neo Metool. Amazon are offering online game codes for each avatar, meaning you buy a code from Amazon that's redeemed on PlayStation Network to receive the avatar. Codes won't be distributed until the 31st, mind you. Capcom's made a trend as of late to offer up character based PSN avatars with batches of avatars being made available on weekly PlayStation Store updates each Tuesday. Previous incarnations included characters from Street Fighter III and Darkstalkers. Looks like Mega Man is up next! I'll update the post with images as soon as they are revealed. 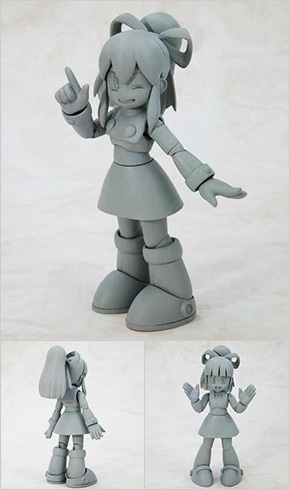 Here it is, our first look at the third Rockman figure from Kotobukiya: Blues! Presented at Chara Hobby 2010 event in Japan, the poster reveals Blues will feature a detachable shield and three face plates (hopefully one of those includes Break Man). While pricing and a specific release date weren't revealed, the poster reassures convention goers to expect the figure by the end of this year. Update: Scratch that. The model is not coming out by the end of the year, but sometime in early 2011. Thanks for the tip, Stan. Posted at Capcom Unity a couple days ago, here's a teaser trailer for the upcoming "Mega Man Olympics", a competition of... something set to take place between none other than Capcom Unity's community manager Jgonzo and Rockman Unity's Ucchy. The event took place at San Diego Comic Con last month and is just now being leaked onto the net. Err... yeah. What do you make of all this? Something made just for the fun of it, or is there some kind of ulterior motive behind the insanity? I dunno; maybe it's the beginning of some sort of promo for Mega Man Universe, especially since Ucchi, the head honcho behind all the Mega Man Universe happenings in Japan, is involved. It's funny, not even Capcom Unity themselves knows what's going on! Whatever the case, the "coming soon" at the end of the video promises more fun is to come. Can't wait! So... wow. From the looks of it, we just bared witness to some sort of robot uprising taking place within a dystopian classic series universe -- yet -- the trailer cuts to footage of Iris, Alia and Signas (X series characters), toiling away as if they're providing aid to the very situation at hand. Classic/X series crossover, anyone? 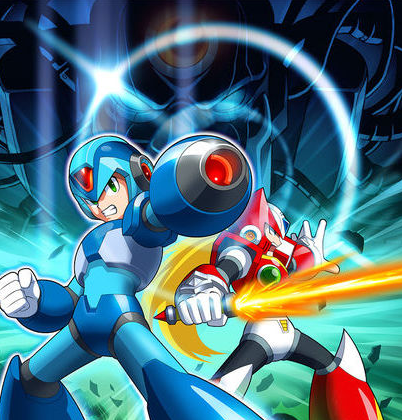 According to Stoo.com, the source of the trailer, the game will indeed feature characters from both series, specifically outlining the presence of classic Rockman, Blues (Proto Man), Forte (Bass), X and Zero. Just how these characters will relate to one another is unknown at this time so it's up for speculation. Aside from the above tidbit about characters, no new details about the game were revealed. However, once again, various Korean sites are promising more details will trickle out in the near future. If you're new to this whole Rockman Online hubbub, allow me to summarize what we know so far: Rockman Online is a side-scrolling action RPG, boasting 3D graphics on a two dimensional plane, much like Mega Man X8 and Maverick Hunter X. 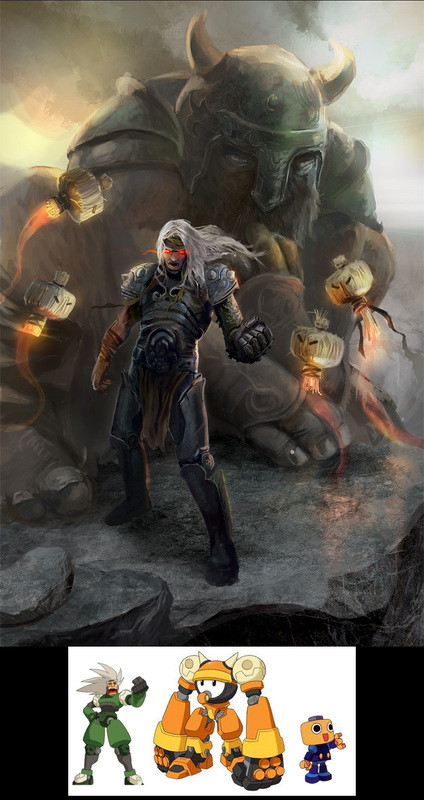 Familiar faces and NPCs will make up the game's cast in addition to online players. 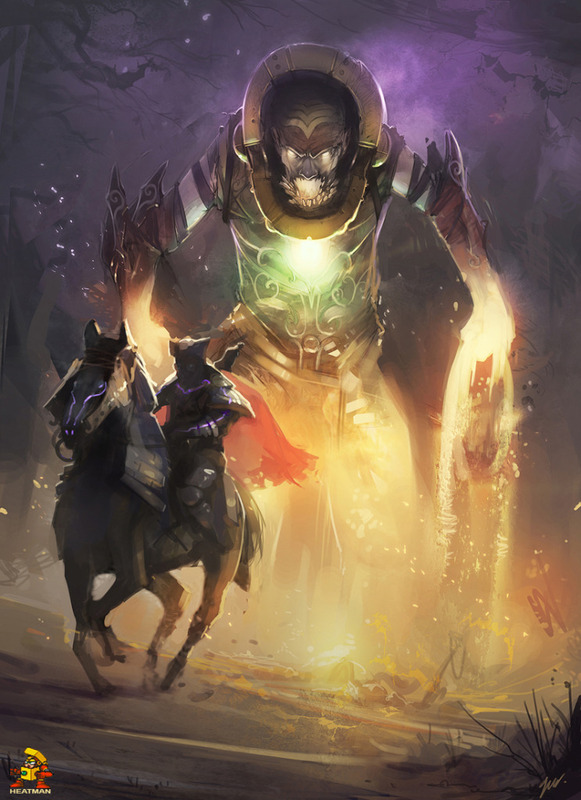 The game is being cooperatively developed by Capcom and NeoWiz with plans to distribute the title exclusively in Korea and Asian markets by the end of 2010. While there's been no word of a release for the West, a Japanese release is likely, if a trademark is to be believed. Hopefully, more updates sooner rather than later. "Mega Man Universe is really cool. The curtain will be lifted a bit more at PAX." It's unknown just what shape or form Mega Man Universe will take on at PAX but one thing is for sure: don't expect a complete unveiling. That said, I assume we'll most likely be learning everything there is to know about the game at Tokyo Game Show, which is just around the corner, too (September 16-19). PAX begins September 3 at Downtown Seattle, Washington, ending on the 5th. All the details on the show can be found here. I'll be keeping you posted on any developments. Stay tuned! It's every fanboy's (and fangirl's) dream to have a classic and X series crossover. Two Mega Men, from two different eras, coming together to vanquish evil. 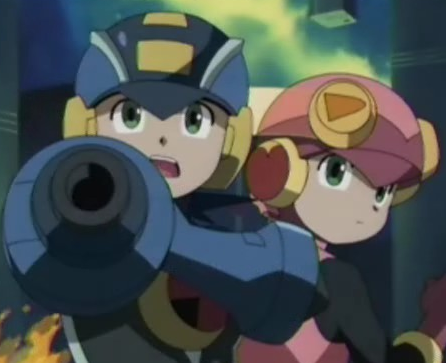 Aside from a short-lived comic series from Dreamwave and an episode of the Ruby-Spears cartoon, classic Mega and X have never crossed paths in a game... or have they? Okay, so a tennis match isn't the neatest venue for the two to meet, but pretty cool we got to see something like this happen, even if it was through a series of still images (the video itself, according to the author, wasn't intended to show off X in play, but his theme music -- hence the lack of actual gameplay. Still, you get the idea). 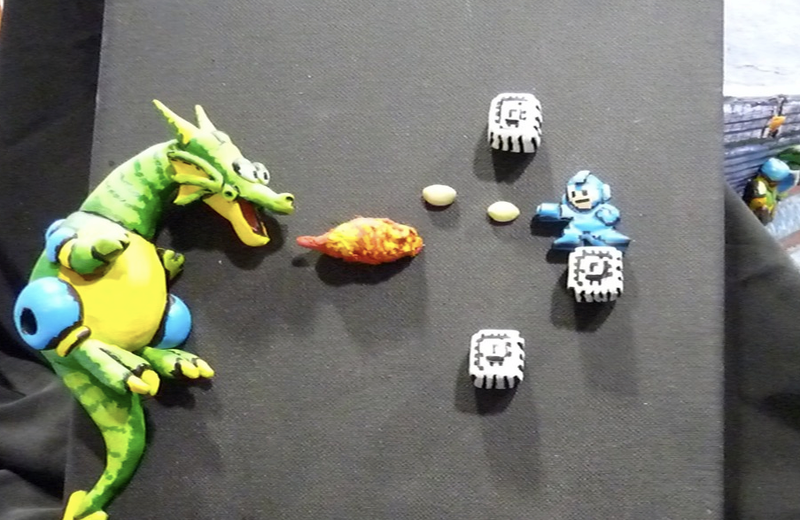 One has to wonder if this will be the last time Mega Man and X will meet. If not, maybe the next opportunity will be a little more action oriented and not a competition in athletic ability. 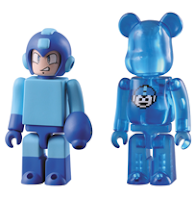 Haven't nabbed the Mega Man Kubrick and Bear Brick sets yet? Now might be the time to do so. The ridiculously cute figures are seeing a price cut as part of Capcom Store's Deal of the Week -- marked down to $35.95 a pop. That's 10% off their original $39.95 price tag. As a special bonus, you'll also get one free Mega Man Zero Collection collector's pins (at random). The deal also extends to ordering both figures. Purchase both the Mega Man and Proto Man Kubricks and you'll save ten bucks and get a free button. Bear in mind, this deal won't last forever: it ends Thursday! Full Deal of the Week details available here. For your convenience, here's a nice handy dandy list of import retailers currently accepting preorders for the Kotobukiya Roll model, slated to ship in December. Amiami was first out the door to offer preorders, but more shops are quickly following suit. Links to buy the model and prices below. If you're looking to purchase the model, choose which shop best fits your budget and order away. Shipping and handling fees vary depending on the retailer and your location, so the final price tag could end up being a pretty penny. As mentioned earlier, Roll isn't expected to ship until December. 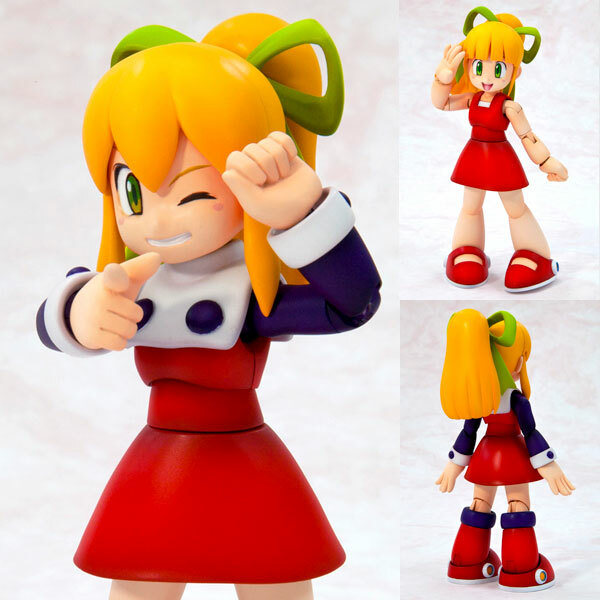 Her counterpart model, Rockman, is due to release at the end of next month and a Blues model (Proto Man) will be coming along before year's end. 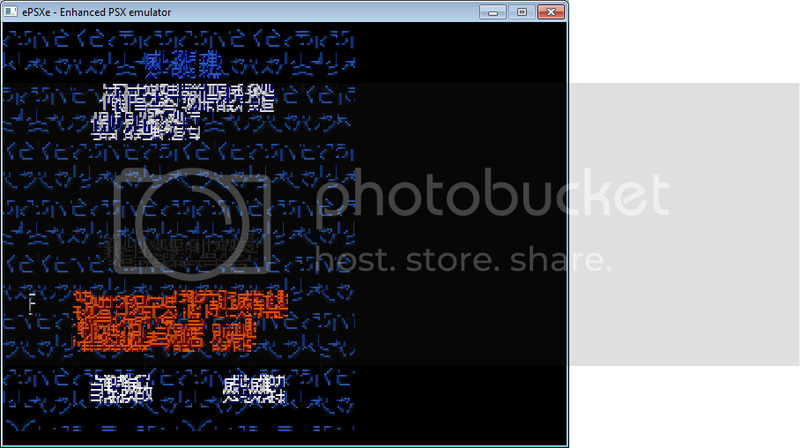 Considering the fact it's not very often betas of Mega Man/Rockman games get leaked, I just had to post this up here. 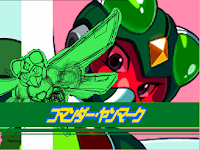 Reader Techokami sends word that Skaarg, a member of the Sonic Retro forums, has dumped and released an early prototype of Rockman X6 onto the net, which you can download here. 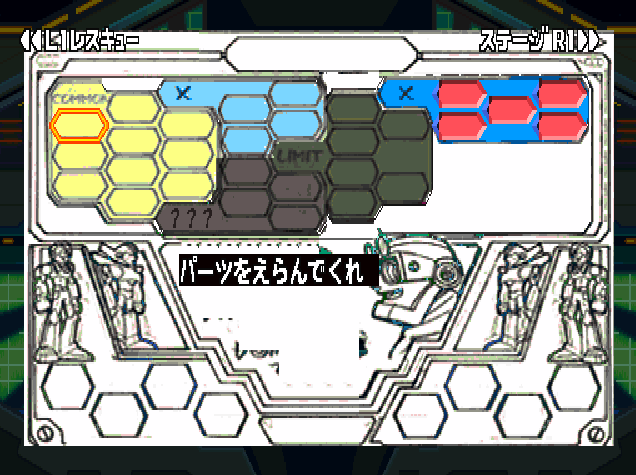 The Nightmare System, while present, is not indicated by red boss portraits on the stage select screen. Stages lack armor capsules and heart tanks. Controller options, save menu and loading screens are graphically broken. As seen in pre-release screenshots, minor bosses have a skull emblem under their lifebars. The boss approach "WARNING" alert is vocalized. 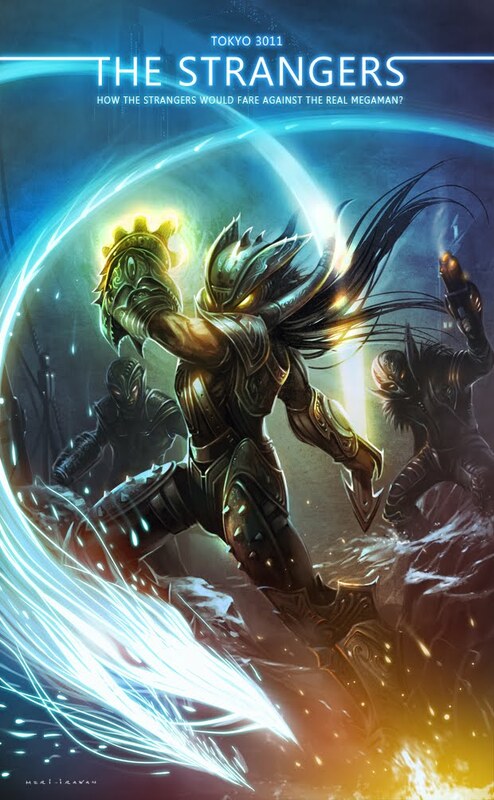 There are no sound effects during cutscenes (such as hums of machines or howling winds). Falcon Armor's Giga Attack lacks sound effects. Stage background graphics are incomplete and glitchy in some areas. High Max's battle sprite is a brighter hue. Nightmare Viruses in Commander Yammark's stage do not infect rescuable Reploids. When fighting Nightmare Zero, his armor is traditional red whereas in the final, it's purple/pink. Rainy Turtloid and opening stage BGMs are slightly different, lacking instruments. As seen in early screens, the giant Reploid, Illumina, is restrained by energy cables. There's a brief conversation between X and Infinity Mijinion upon entering his stage. In the final, this conversation takes place when confronting Mijinion at stage's end. Portals to the secondary paths are green instead of blue. Falcon Armor dashes at a slightly longer distance than final's. There's probably a few more oddities/differences present so I'll be on the lookout for those when I play the proto for myself tonight (might even record it and put it up on YouTube, or something). I'll be updating this post accordingly and, should you find anything interesting, speak up in the comments. Thanks for the tip, Techokami! 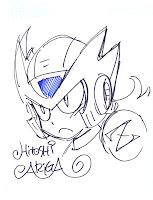 Just sending out a friendly reminder that Hitoshi Ariga, author and illustrator of Mega Man Megamix, will be attending Fan Expo in Toronto next week from August 27-29. Not only slated to appear at Udon Entertainment's booth for autographs, but he'll also be doing a panel on Saturday. Further, for those who cannot make it out to Fan Expo, Ariga will be appearing at the Japan Foundation on Thursday, August 26th at "Mega Man! Megamix! Mega Event! ", an event held in Ariga's honor. This event is free to public, but Udon informs me an RSVP is required due to limited space. With so much going on, it's easy to get confused, so Udon has hit us up with a press release detailing everything going down next week in great detail. Check it out for yourselves after the jump! Several years ago, Japan was graced with a line of classic series re-releases on the original PlayStation under the label Rockman Complete Works. 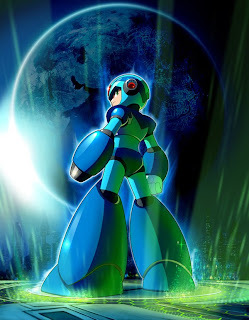 Contrary to popular belief, the Complete Works games did, in fact, make their way to the U.S, going on to form the core of 2004's Mega Man Anniversary Collection. Unfortunately, MMAC stripped down most of what made the Complete Works games so neat; numerous modes and extras such as unlockable art, an enemy encyclopedia and the famous PockeStation features. Fortunately, English speaking fans may yet have a chance to enjoy the Complete Works games in their entirety. Henger83 has announced, via a series of YouTube videos, is currently hard at work at translating the Complete Works version of Rockman 1, along with the aid of a fellow Japanese gamer. The project is in the early phases, but is already making steady progress. Check out more in-depth details after the jump! It took Jaroshbarksdale roughly three months and a hundred hours total to design the games and it really shows. Excellent work! For the last month or so, we've been ogling over a bland, grey prototype of Kotobukiya's 1/10 scale Roll model. While the figure itself looked top notch, I think we could all agree it's in desperate need of some color. Thankfully, this is no longer an issue as Kotobukiya has revealed a full colorized version of the model online today. Spiffy, isn't she? Plenty more shots where that came from; head on down to Ngee Khiong, scroll down a bit, and enjoy. Coinciding with these colorful photos, Kotobukiya also revealed the figure's price tag of $36.74 USD. Preorders for the model have already begun with Amiami Shop offering it at a slightly lower price -- $27.18 USD, not including shipping. Expect more online stores to offer up preorders soon. 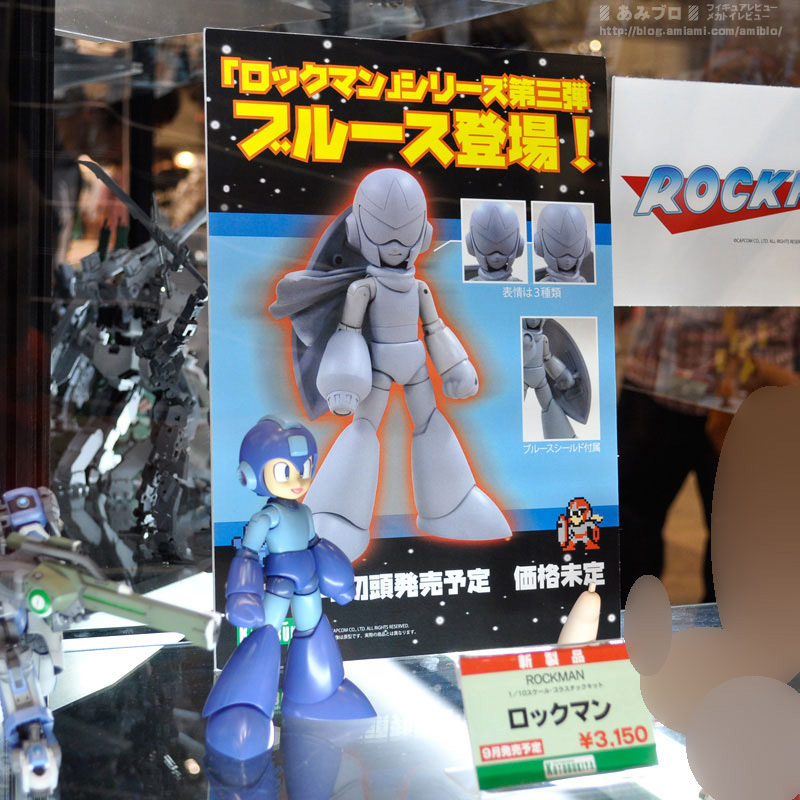 As with the Rockman model, I imagine stores will have varying price points, thus I'll probably be compiling all stores offering the model like I did with Rockman. Look forward to that. According to a report over at Hankyung, Capcom and NeoWiz Games' collaborative project, Rockman Online, is set to launch in Korea later this year. While a specific release date wasn't disclosed, RMO, alongside two other titles, is said to make up NeoWiz's lineup for the remainder of 2010. Unfortunately, the report was mum on new details about the game. However, the article provided a summary of the basics we've known for a while: Rockman Online, a side-scrolling action RPG, will boast 3D graphics on a two dimensional plane, much like Mega Man X8 and Maverick Hunter X. 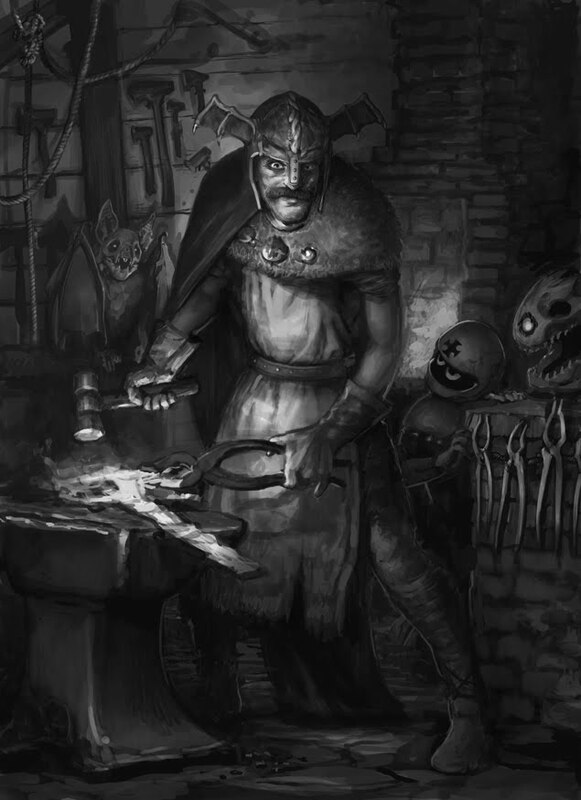 Familiar faces and NPCs will make up the game's cast in addition to online players. Further details are expected to surface in the near future. Rockman Online is currently exclusive to Korea and regions within Asia. While there's been no word of a release for the West, a Japanese release is likely, if a trademark is to be believed. Not much else to say than that. I'll be keeping my ears out for any new information. Wood Man, Ice Man Retro Rotos On The Way? Once considered indefinitely canceled, it appears Jazwares might be looking to finally release the long awaited second wave of Mega Man Retro Rotos, if the packaging of the new 2010 re-released figures is any indication. 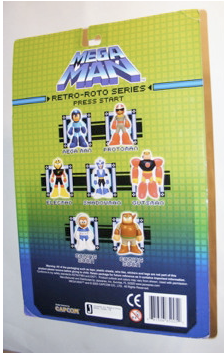 Wood Man and Ice Man Rotos, two figures originally said to be canceled, are being advertised on the backs of the re-released wave 1 figures as "coming soon" (pictured). 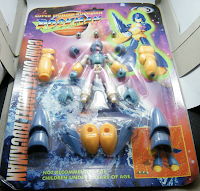 Keen-eyed fans will note that both Wood Man and Ice Man were advertised on the backs of the original 2005 packaging (click for image), back when they were slated to originally release. However, what's interesting here is Jazwares could have taken this opportunity to remove the ads on the new packages; but they didn't. They did, however, remove all mention of the Build-A-Bot figure, whose pieces are no longer included in the re-releases. Was their inclusion an error or intentional? Jazware's has yet to comment, but past remarks made by Jazwares' National Sales Coordinator, Scott Levine, indicate the company is pushing to get wave 2 out the door along with a line of new 3.5'' figures. Further, it appears even Jazware's own website is gearing up for a potential second wave as the site now clearly labels the current, re-released figures as wave 1; a tag dropped many, many years ago. It'd be nice to finally get these guys, so I'm hoping to get the official word from Jazwares soon. In the meantime, you can support the realization of wave 2 by telling Jazware's you want them via Twitter or FaceBook. Thanks to greatbuysguy for the image. Mega Man 2's Wily castle theme is undeniably one of, if not the most famous song in the series. Its popularity has warranted a plethora of renditions, interpretations and remixes over the years -- played on practically everything from guitars and pianos to violins and flutes. Today comes another version of the song... played on an accordion. How does it fare? Have a listen. Impressive, to say the least and it sounds very close to the original song. Even if you're sick to death of the theme, you've got to admit that was pretty good. Personally, I've yet to tire of theme and always love hearing stuff like this. Looking forward to the next big interpretation! 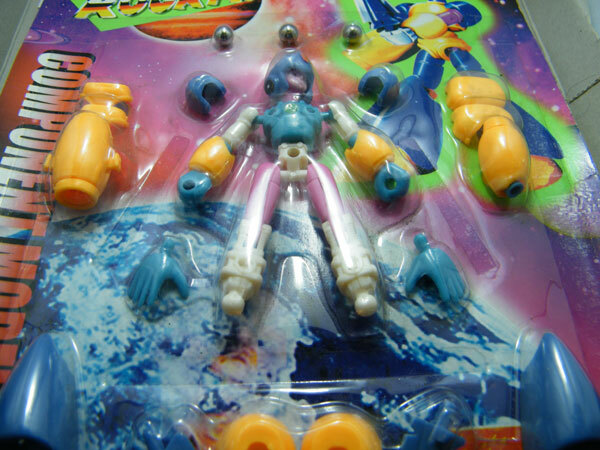 From the wacky world of Thailand bootlegs, comes two more unlicensed Mega Man products that are sure to raise a couple eyebrows. Admittedly, not quite as obscure as the space gun from last week, but pretty bizarre nonetheless. Spotted by Rock Miyabi and Rummenie, here's a cheap wannabe Mega Man X, based off of Bandai's Mega Armor model kits. 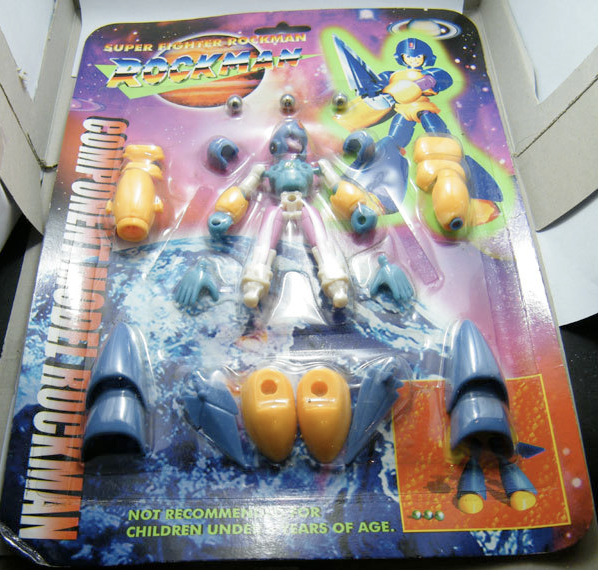 "Super Fighter Component Model Rockman" here apparently sports two Busters and a blue/yellow armor that just reeks of Mega Man 1 American box art influence. Interestingly, the toy is capable of firing little pellets from its Buster(s), so it's certainly unique in its own right. The toy's actually up on Ebay right now if you're interested in adding this oddity to your collection. 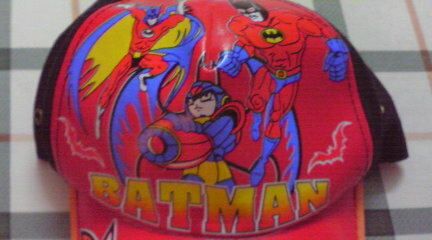 Pretty self explanatory; Mega Man X and Batman, meshed together in one truly psychedelic hat. Quite an odd crossover choice, if you ask me -- I don't even think we have fan-fiction based on that pairing. Interesting bit of trivia: the hat's owner, reader Robert, points out the image of X is actually based off of his player select sprite from Mega Man X4. 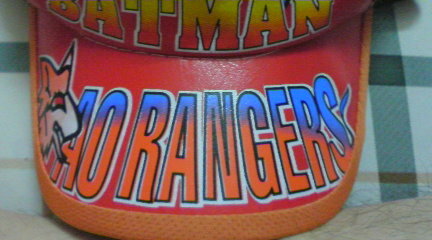 If you happen to come across other bootleg stuff of equal or greater obscurity, send them my way. We'd love to see it! Kotobukiya is exhibiting a prototype of their forthcoming Roll figure this weekend at their direct store in Akihabara, Japan. 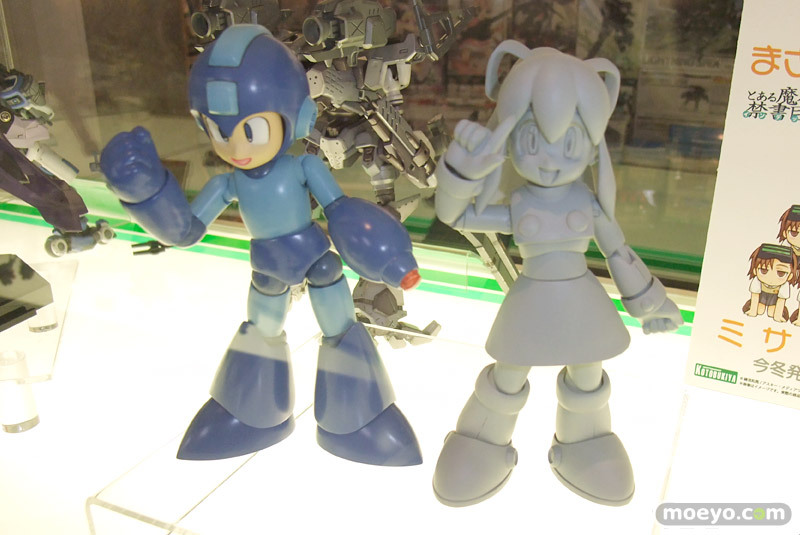 Photos of the display, provided by Seaside Tears and Moeyo, give us a closer look at the figure's details and just how nicely she looks when positioned next to her Kotobukiya brethren, Rockman. 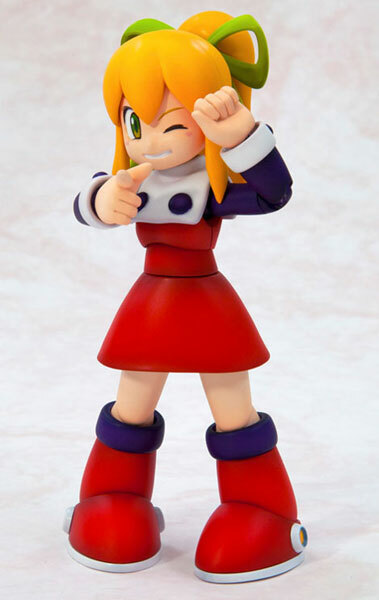 Meanwhile, Capcom Japan recently added a tiny blurb about the figure on their Rockman 10 website, showing off a couple poses, too. 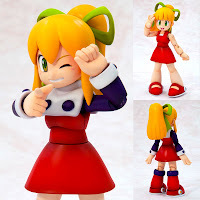 As detailed earlier, Roll (releasing in December) comes with interchangeable parts that can be arranged to resemble her classic NES look or her Mega Man 8 look and a series of swappable faces and hands. 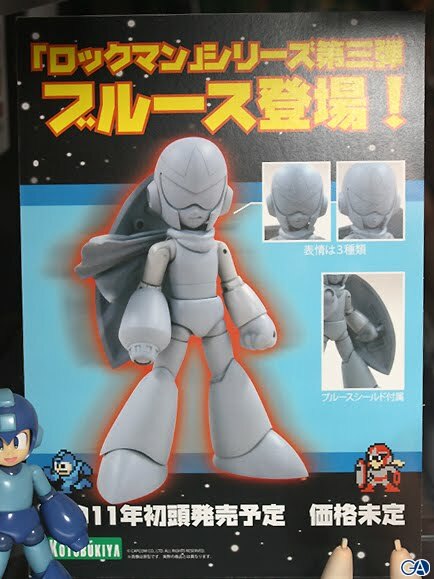 Like the 1/10 scale Rockman (slated to release late September), Roll stands at 13cm in height with twenty points of articulation. Bear in mind, what you see is a prototype so the final design may vary slightly. 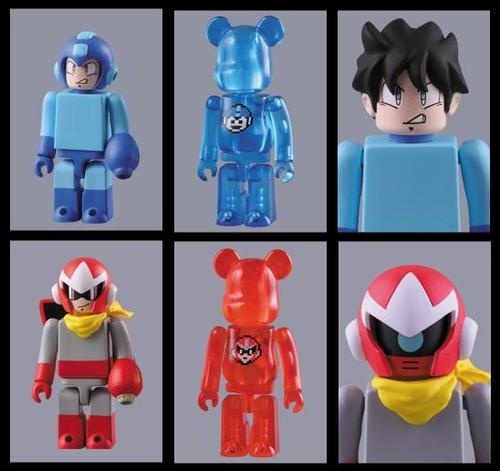 We've seen our fair share of classic series inspired headwear, but not so much stuff based off of the many other Mega Men. 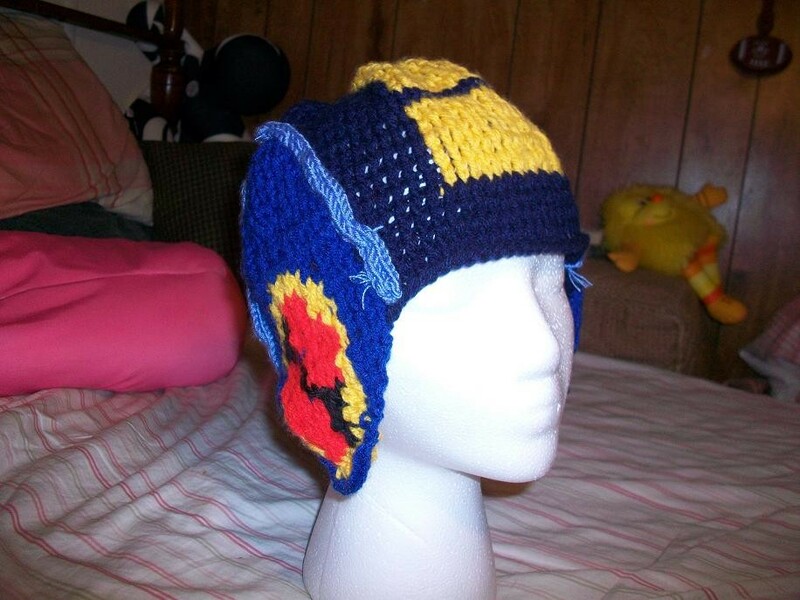 For a change of pace, crafty Etsy member BlackKat009 has knitted a hat that will surely keep Battle Network fans' heads warm this coming winter in the form of Mega Man.EXE's helmet. BlackKat009 is selling the cap, among other knitted creations, on her Etsy store. She's even willing to customize it to your liking from size and shape to color scheme. Ask nicely and perhaps she'll design something based off one of Mega Man.EXE's many Style Change helmets. More photos and details on how to order, here. 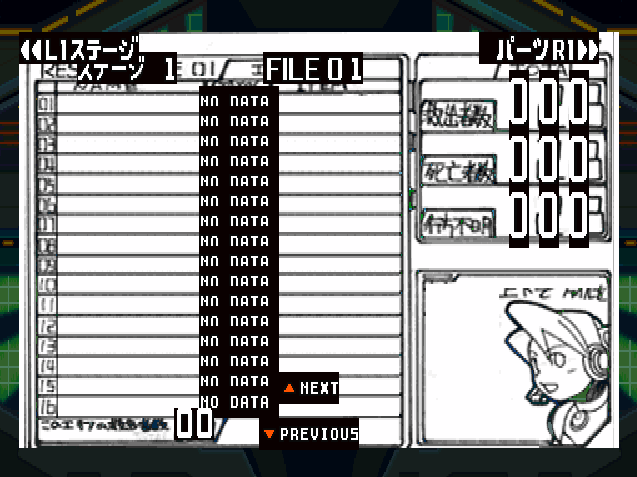 Oh, and speaking of Mega Man.EXE, I'll have an update for you on the proposed English Operate Shooting Star translation patch soon. Can't say much more than that right now, but stay tuned! You've mentioned before that you're not fond of the way Mega Man 3 was developed, that you were rushed through the process to release the game on time. Would you ever want to go back and remake that or any other Mega Man title, similar to the way CAPCOM remade Bionic Commando with Rearmed? Inafune: Would I like to remake just Mega Man 3? Probably not so much. Would I like to remake the entire series with a modern look and feel? That's something I'd be very interested in doing. Something like Mega Man Universe? How did the idea for that project come around? Inafune: Universe is a unique project. As the title suggests, it's big. It's a whole universe. Some aspects from older Mega Man titles that I wanted to revisit might find their way in there, but it's going to expand far, far beyond that and be all about what fans want to see. People must ask you this next question a lot, so I apologize. Do you have any plans to make another Mega Man Legends game? Inafune: I do hear that question a lot, and it's still very much on my radar. My big fear is that if we did start doing it, investing all that time and money into it, the fans would just say “we don't need that.” If I do end up doing it, please support me and don't change your minds halfway through! Who's your favorite Mega Man boss character? Inafune: Well, he's not necessarily my favorite character, but the first character I designed for the games would be Elec Man, so I have a soft spot for that character. I was reading American comics at the time, so I got that sort of imagery with the mask and everything. Be sure to check out Anime News Network for the complete interview. Thanks for the tip, Ralene! At last, we have ourselves a firm release date for Mega Man Megamix vol. 2 and Mega Man ZX vol. 2. Udon Entertainment's own Matt Moylan sends word that both books are set to hit comic book retailers on September 8th. However, the release date for online vendors and bookstores is a bit less precises; could be a few days earlier or a few days later, but comic book shops will have them in stock on the 8th. To keep you busy until then, you can check out previews for both volumes over at Udon Entertainment's official blog. I'm also pleased to announce that Udon intends to hit us up with more exclusive previews right here on the blog as we approach the books' release. Stay tuned! 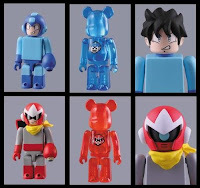 "In addition to the ServBot Bobble Budds, I just added the Mega Man Kubrick & 1Up Bearbrick set and the Proto Man Kubrick & 1Up Bearbrick Set. Available in the Asian market for a while now, we made an exclusive deal with Medicom to localize them for the Capcom Store. The packaging is all in English! 500 of each set were produced exclusively for us. Buy them both together and get $5 off." Also of note, the 7cm tall Kubricks come with additional parts. Mega Man has interchangeable pieces that make him helmetless, two different facial expressions and a removable Buster, while Proto Man comes with an optional Break Man face and removable Buster and shield. 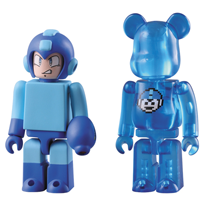 Additionally, each figure has their own "Bearbrick", a translucent bear figure touting sprites of the character's respective 1UP icons on their chests. If you'd like to guarantee a set of your very own, you may want to preorders your set(s) now -- they're going to go quick! Click the respective links above to preorder. 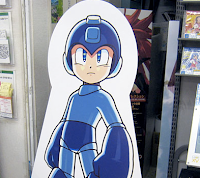 A little while back Capcom released these ginormous E-Can cushions in honor of Rockman 10's release. Now, the company is prepping another soft and cuddly product -- a 1UP cushion! Featuring a classic 1UP sprite against a vibrant orange case, the pillow measures in at an astonishing 35cm by 35cm and is made entirely of polyester. At that size, it perfectly complements the 30cm by 30cm E-Can cushion. The pillow is slated to release in September for 2,100 Yen or roughly $24.58 USD, and is available for pre-order via E-Capcom, Capcom Japan's specialty online store. I advise shopping around your favorite import shops if this is something to your liking. After all, who wouldn't want to snuggle with that? The source of this news, Korean based fan RockMaster, believes Rockman Online could be released as soon as this year with beta testing beginning shortly. Screens and videos of the game in action will likely surface around that time. Hopefully, we'll be getting some more concrete info on the beta (and how to participate) soon. Till then, please do admire the lovely new teaser image! After eight years of being on Japanese air waves, the animated Rockman franchise has come to an end. Kids-Station, home to reruns of Rockman.EXE Beast and Ryuusei no Rockman, has chosen to remove both shows from their schedule with no signs of either show, or previous seasons, returning any time soon. For the first time in eight years there is no Rockman to be found on Japanese television. While new episodes of the animated franchise haven't been produced since 2008, Capcom continued to sponsor the EXE and Ryuusei television series on Kid-Station, since 2007, in the form of reruns. Kids-Station also played host to a short-lived mini-television series entitled "Rockman Stadium", a program that aimed to promote the then up-and-coming Shooting Star Rockman 3. Stadium ended its run in the Fall of 2009. In short, you could find Rockman on TV ever since 2002, despite the lack of any new episodes or series. Seeing that Capcom has recently used reruns to promote new EXE/Shooting Star games, the chances of shows re-airing is always a possibility, but we've yet to hear even a whisper if a new game from the "Network" series is in development. Frankly, I'm a bit surprised; we traditionally hear something right around this time of the year. Thanks to Ristar for the news! 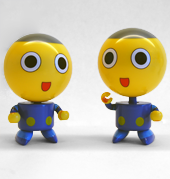 At this year's Comic-Con in San Diego, Capcom sold a limited amount of insanely adorable Servbot "Bobble Budds" figures, limited to 1000 units. If you missed out on picking one up then, you'll be happy to know that Capcom is gearing up to sell them in their own online store on August 12. The bobble budds aren't your average bobble head -- the little guy's head acts as storage for the rest of the body. Snap the two pieces together and you got yourself a bobbling Servbot of your very own. Capcom is currently taking pre-orders for figure, set to sell at $9.95 a pop. Quantities will be limited to around a 1000 500 units, so you may want to pre-order ASAP -- they're going to go fast! EDIT: Scratch that note about a 1000 units -- they're down to 500! Thanks for the heads up, jgonzo! I've seen quite a bit of fan-art in my time, but nothing quite as unique as this. Over at the CGHub forums, computer graphic artists are being tasked with re-imagining characters from the Mega Man universe with a Dark Age fantasy twist. The results are simply astounding, to say the least. Can you figure out which characters these are? For the uninitiated, we've got Zero, a blacksmith Dr. Wily, the Bonne brothers (with Servbots), and one truly menacing Heat Man. And that's just a small sampling of their efforts; you can find plenty more over at the competition's official topic here. Most art featured isn't final as the actual contests isn't over until August 9, so some pieces are probably subject to change. Nevertheless, it's all pretty amazing. While browsing eBay today, I came across something of an oddity. A so-called "Mega Man Space Gun". 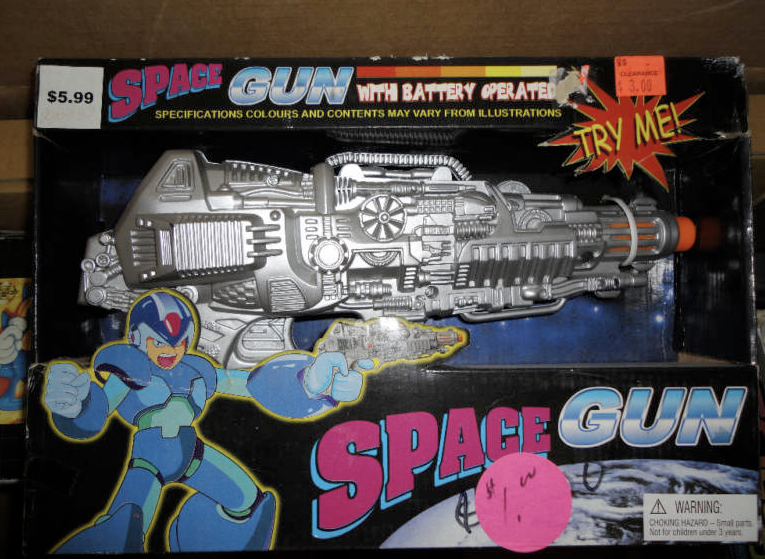 The seller makes it apparent in the description that, clearly, this is not an official product licensed by Capcom -- but most likely one of those cheap, knock-off toys that you'd find at your run-of-the mill Dollar Tree or Goodwill. 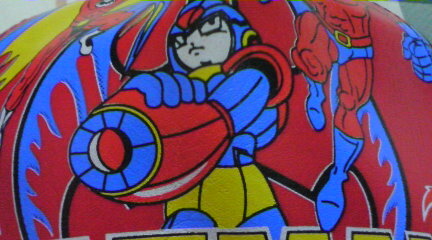 Due to the fact that a poorly traced Mega Man X -- or, at the very least, a character based heavily upon the Maverick Hunter's likeness, makes an appearance on the packaging, I figured this would be of some interest. Unlicensed, yes, but would definitely make for a nice addition to your collection just for kicks and giggles. Check out the complete auction here. Spot anything similar to this in the wild? Feel free to share what you've got in the comments! 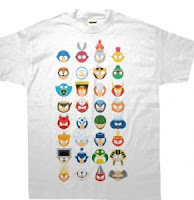 For those into gaming apparel, specifically, Mega Man tees, then you'll dig this homemade minimalistic shirt by AshRB. 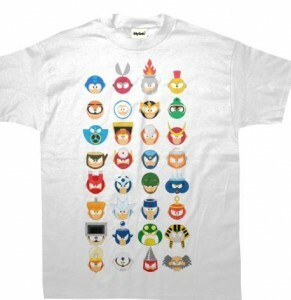 The designer tee, on sale over at MySoti, touts a colorful display of Mega Man and co., with Robot Masters ranging from Cut Man to Drill Man...and Dr. Wily! The tee is available in a number colors and sizes, so you can pick and choose options to your liking. It'll set you back around $20.00, but customization does add on to the base price plus standard shipping. Quantities are limited so if you or someone you know would like one, now is the time to order! Snag yours here. Thanks, Jim! 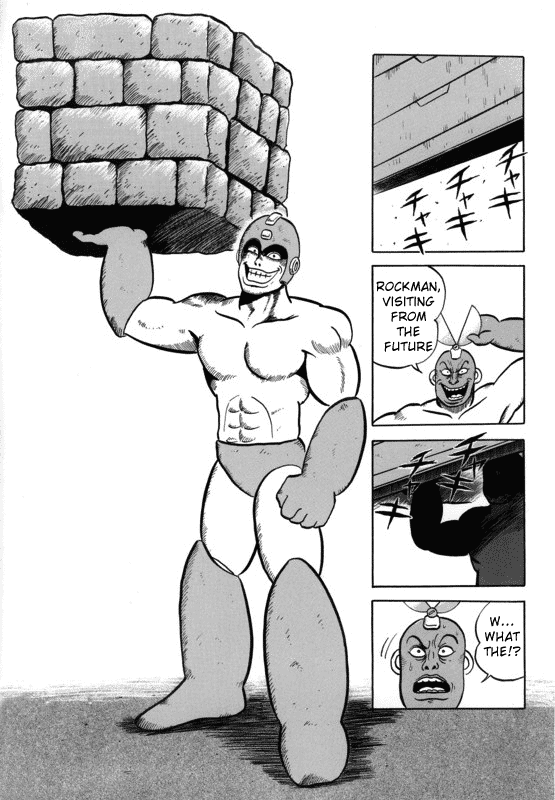 Hitoshi Ariga's latest Rockman anthology is seeing a slight delay. 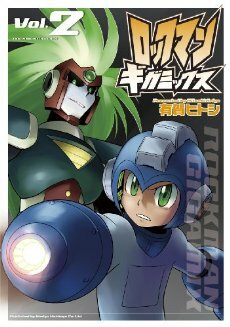 According to online retailers Fukkan and Tanomi, the anticipated Rockman Gigamix volume 3 has been bumped from July to mid-September. Coinciding with the delay, the book's pricing was revealed; 1,200 Yen or roughly $13.85 USD. Ariga's been pretty tight lipped on Gigamix 3 details, keeping its plot shrouded in mystery. However, it's assumed Gigamix 3 will pick up right after the events of Gigamix 2, which ended on a bit of a cliff hanger. I won't spoil things here, but you can check out a detailed Gigamix 2 plot summary (with scans!) over at Rockman Perfect Memories. Future Gigamix 3 updates are expected to pop-up over at Ariga's official blog where the author/illustrator traditionally reveals upcoming volumes' cover art and other tidbits publicly. Stay tuned!